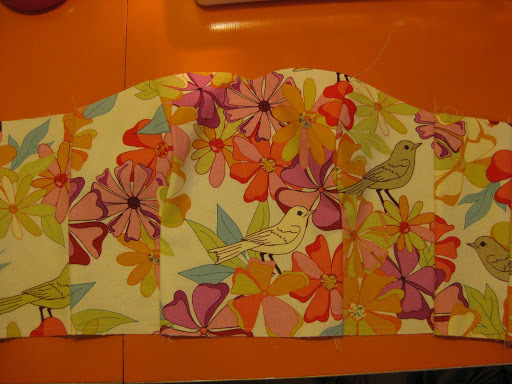 a little birdie told me, pt 4: last finishings! finished!! actually this dress has been finished for weeks but i never had an opportunity to photograph it. so after a little disappointment over my not really a waist stay, i moved on to the other finishings. and a long narrow sash to tie around the waist. how do you like it? 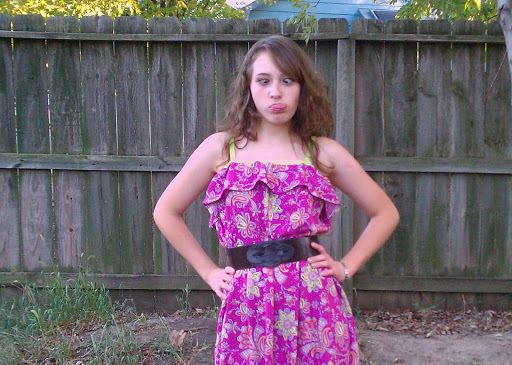 i have to confess, i thought i would end up hating this dress.i’m awfully hard on myself for the littlest mistakes. the failed “waist stay” and after all that fitting i did early on it’s still a little loose in the bodice. my initial thought was that the dress was hopelessly ruined and i would never wear it! i know, it’s silly. but after not looking at the dress for a couple weeks then putting it back on this morning to take pictures i realized how utterly ridiculous i was being. yes, it’s a little looser than i intended. but hey, now i have a dress that i can confidently look great in even on fat days! and really, what’s better than that? 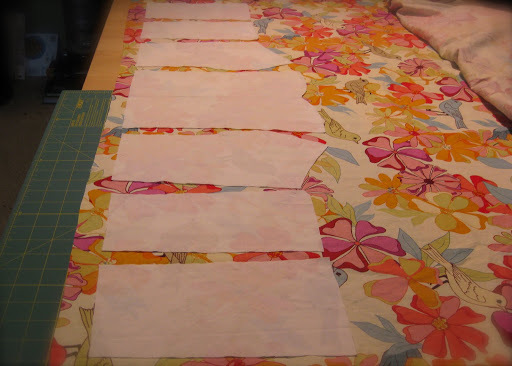 when i use this pattern again i’ll bring it in 1/2″-1″. but realistically i’ll be wearing this particular dress when i’m toting the kids along, not going to some formal occasion. and nothing is worse than trying to bend over to pick up a 2-yr old and being afraid of splitting a seam or busting a zipper in the process! i absolutely adore the dress and will definitely wear it often! 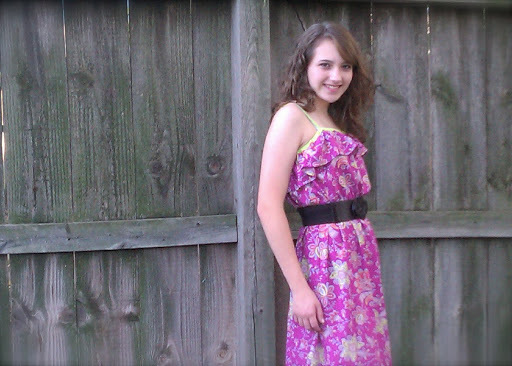 the slight changes i made to the pattern style really made an impact on the overall look of the dress. 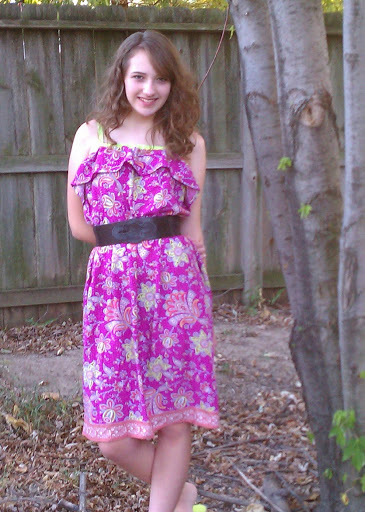 it just wouldn’t be the same without the sweetheart neckline and piping, i think. 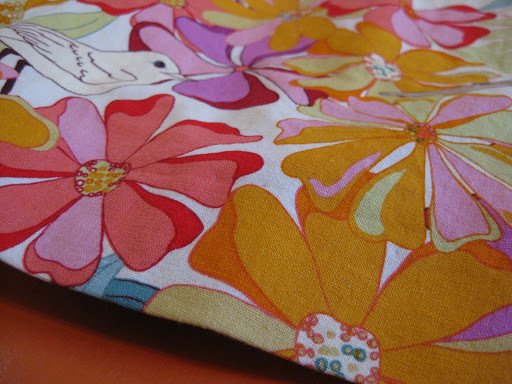 and how much do you love this fabric? 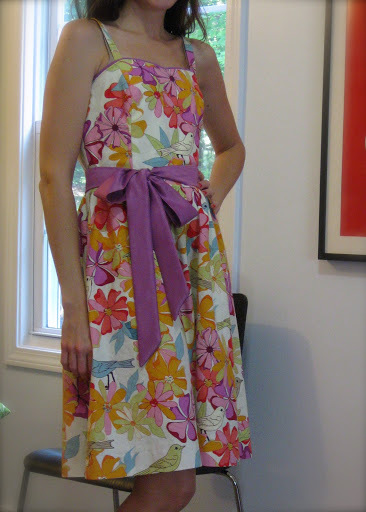 i’m so glad i decided to make this one last summer dress! my only complaint is how huge the pattern was for the size chart. i could have gone down two sizes to begin with! for a fitted bodice (with a strapless option, no less!!!) i would expect the pattern to have a much closer fit. i know i’m pretty narrow on top and have come to expect to make certain alterations but this one just seemed most extreme! if you are looking for a princess seamed bodice pattern as a starting point (and have a smaller than c cup chest), i couldn’t recommend this pattern. there are a hundred others to choose from, and hopefully one with a better fit! however, having a basic princess seamed bodice pattern is a must for any sewist and i’ll continue to refine the fit of the pattern for future dresses. it’s a simple thing to switch out the skirt for something more voluminous or straight or pleated or circle or tiered and to add various embellishments to the bodice. the options are endless. 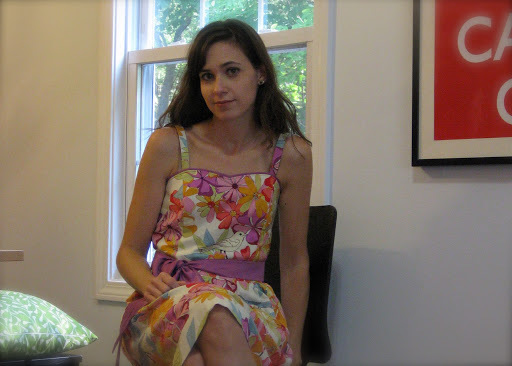 this type of bodice is a staple that will show up over and over again in my sewing. having well fitting patterns in your stash are truly the key to sewing freedom and eliminate the need to run out to buy a pattern every time you want to make a new dress! but how would it look in big? 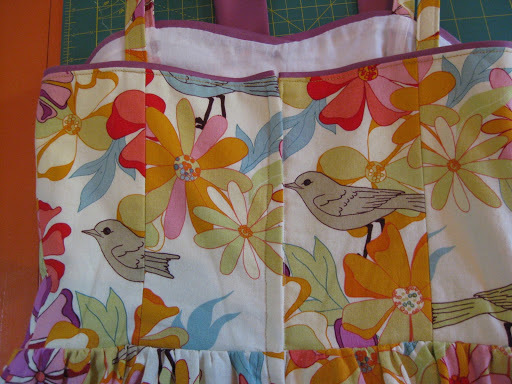 my birdie dress is finished (and fabulous!) but i need some pics before i can show off the final product. i’ve been super busy unpacking and rearranging (we just moved, btw…) and this and that… yowza. what a headache! i will be so happy when life feels normal again. you’d think i’d be a pro at this moving business by now, after all this is my 7th address over the course of 9 years of marriage… no wonder i feel like such a lost soul some days! anyways, in case you read my “i’m not ready to give up summer” dress posts a while back and thought: okay, but would it work on a grown up? my fabulous little sister monica whipped one up and here it is! how cute is she, huh? beauty runs in the family, of course. she used one of those great amy butler prints in rayon. i’ve been eyeing that fabric myself… i love how the border print adds a nice touch at the hem and the green bias tape is an extra pop of color. since she lives in kansas—in the middle of their hottest summer ever—i know she’ll get tons of wear before fall hits. 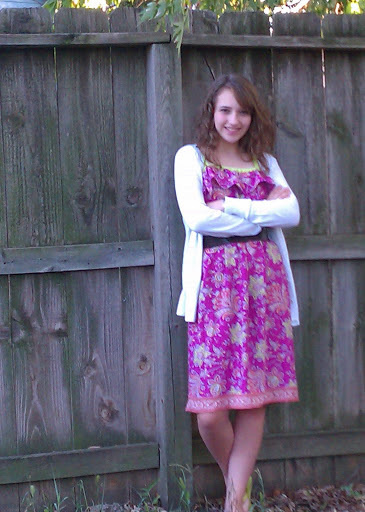 and here it is with a cute cardigan. i’m so happy the dress worked out for her, can you believe she’s only been sewing for a year or so? 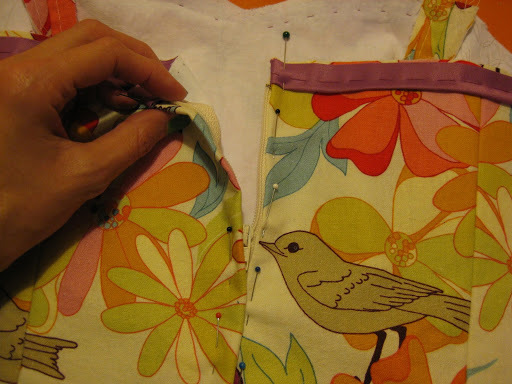 when i left off i had just finished the flat piping and topstitching on the bodice. so after finishing that i cut my bodice lining. i decided to baste the bottom and center back of my lining to the bodice so i could sew it to the skirt all in one piece. i left the top open to slip stitch in place later because i hadn’t quite decided what kind of straps to do, i wanted to see what the dress was going to look like first! 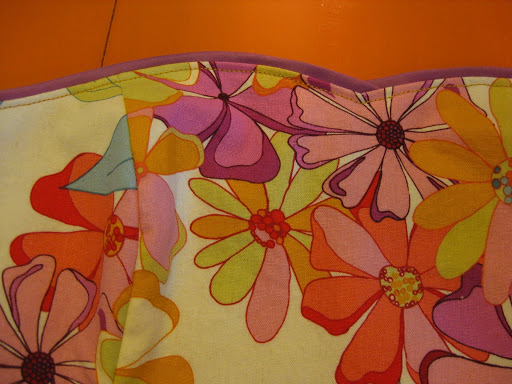 my lining is cotton voile, which is super thin and a little shifty to work with. 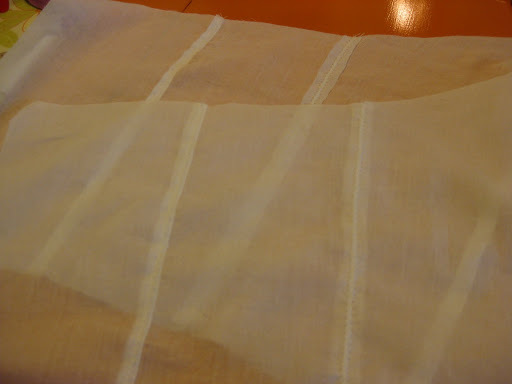 ah, patience… something i don’t have much of… i chose it because the cotton/linen blend of the dress is fairly heavy so the voile won’t add any bulk but will serve as a soft layer between the stiffer linen seam allowances and my skin. the skirt is simply gathered and sewn on, i even cheated and layered the fabric and lining and gathered them at the same time. now, usually you would press the seam allowance from the skirt up toward the bodice but i decided to go with a buttressed skirt (who knew there was even a term for that?) where you press the seams down. doing this creates a slightly puffed silhouette to the skirt and a straight line on the bodice. 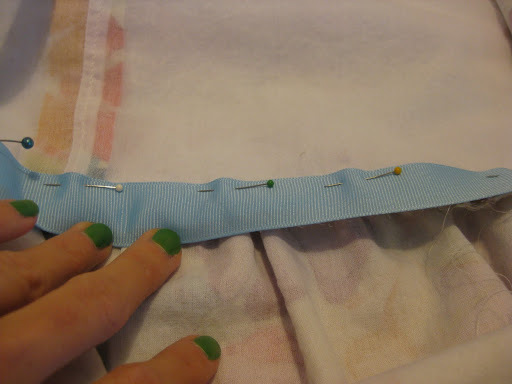 there are a number of things you could do here to really amp up the volume, such as adding organza or some sort of interfacing at the seam (added to the wrong side of the gathered skirt). but, i’m not going for anything crazy voluminous here so i won’t be doing any of those things for this project. i still need to have some sort of support so the seam stays buttressed and doesn’t flip up. this is where the not really a waist stay comes in. 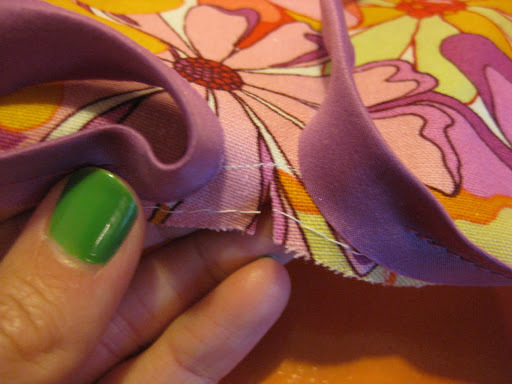 okay, if you’re unfamiliar, a waist stay is usually made of grosgrain or petersham ribbon—the stuff that is stiff and ribbed—with about a 1″ width. it is attached to the garment at the waist and is about 1″ smaller than the actual garment’s waist measurement. the waist stay does a number of things but mostly it keeps strain off the zipper and it anchors the waist where it belongs on the body. now, when i started this dress i really only had passing knowledge of a waist stay, so i simply sewed the ribbon to the bodice side of the bodice/skirt seam, leaving the ends free where i attached a hook as a closure in the back. 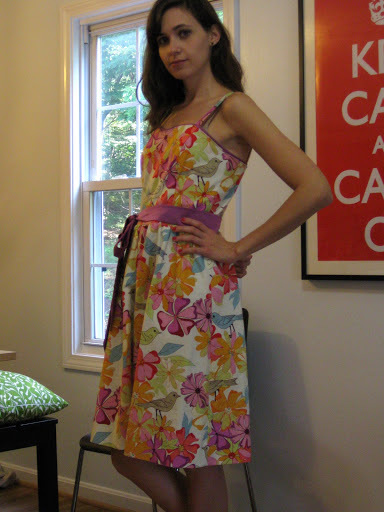 sewing bloggists do a waist stay… but it’s still wrong. don’t do it like this!!! it wasn’t quite tight enough so i adjusted it slightly tighter. unfortunately this just created weird pulling on the bodice. i set this detail aside to fix later and went on about finishing the dress. then a very timely article popped up on burdastyle.com addressing the waist stay. i won’t go into all the details because the article does a fine job of explaining. basically, the waist stay is 1″ smaller than the garment’s waist but the difference is evenly distributed around the dress (duh) and just tacked at the seams. okay, but at least my efforts weren’t useless. the ribbon is definitely keeping the seam going in the right direction and supporting the buttressed skirt. but, as my closure is basically useless, i plan to cut it out and just stitch the ribbon all the way to the zipper and call it a day. sigh… next time, right? then again, maybe i can tack on a real waist stay over the not really a waist stay… the plight of the self taught is always being a technique or two away from perfection. so i continue my learning. each misstep today is one less misstep for tomorrow! 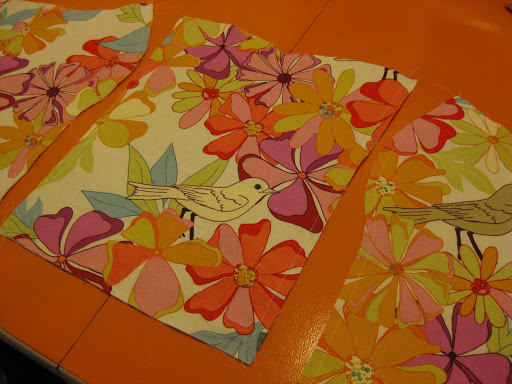 since i already had my bodice pieces cut from muslin, i used these to cut my fabric. i wanted to see exactly what each piece of the bodice would look like before cutting so i placed and cut each piece individually instead of just folding the fabric and hoping for the best. now there is nothing terribly unusual about the construction of this dress but i would like to show you a few details. i have been working at adding embellishments here and there as well as improving my construction techniques (instead of being lazy and cutting corners… having an audience helps to keep me from sliding). 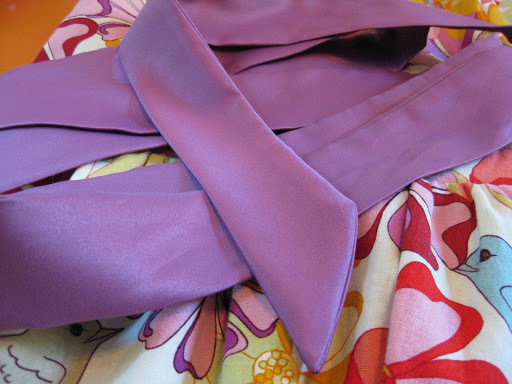 i’ll simply be adding flat piping at the neckline, a little topstitching and a waist stay. well, a not really waist stay… but i’ll get to that later. i’ll even hand stitch the bodice lining and blind stitch the hem by hand! i’m the kind of sewist who does does everything possible to avoid hand stitching, but i figure the dress shouldn’t have to suffer just cuz i’m a little lazy. first thing i did was underline the bodice with my muslin pieces. after adding the underlining i sewed the bodice pieces together. since there are princess seams in this i needed to clip my curves. now, i could have trimmed these interior seam allowances (and almost always the pattern directions instruct you to do so) but i left them as is. why? well, i try to clip and trim only when i really need to. 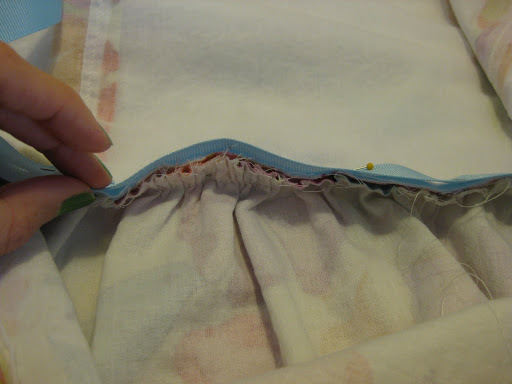 also, you are usually told to press both seam allowances on princess seams to the middle. 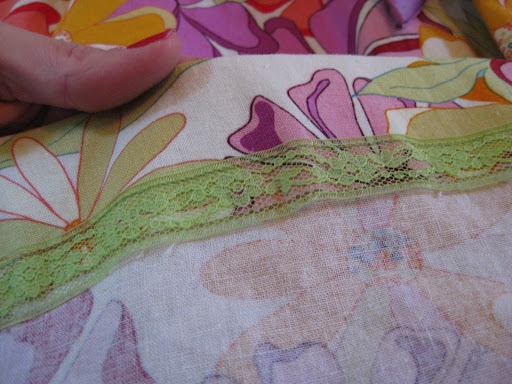 a quick perusal through any couture sewing book and you’ll see that these seams are almost always balanced, that is they are pressed open, even with darts! i suppose this is more important when you have multiple layers with underlinings and such. on a lighter fabric i might press to the center. 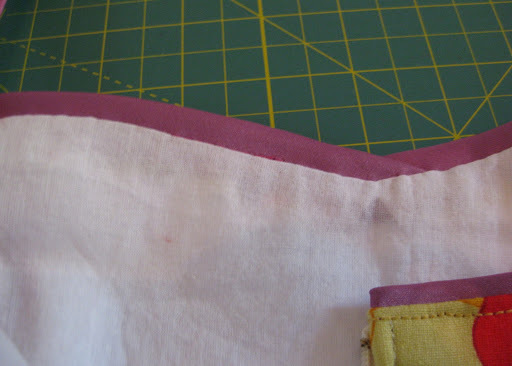 then again, a princess seamed bodice is usually very structured where a lightweight material wouldn’t work… just thinking out loud here… anyway, do notch the seam allowance (cutting narrow v shapes) on the inside of the curve, to ensure it lays flat and press the curved seam over a tailor’s ham. i changed the pattern design from a straight neckline to a sweetheart. there is nothing difficult about the sweetheart neckline it just takes some extra prep. 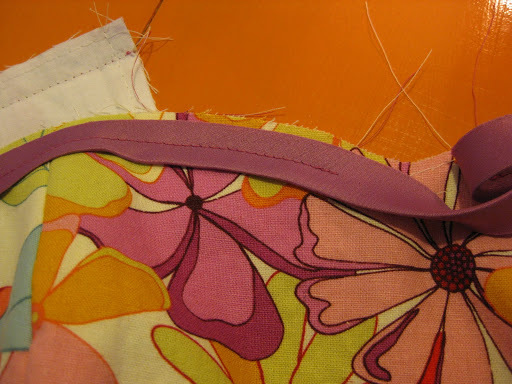 i will hand stitch a lining in later, so i will just turn the neckline seam to the inside with the flat piping then topstitch it all in place. to make sure the “v” turns out neatly i reinforced it with very short stitches right at, or just inside the seam line. i sewed at the “v” about an inch in each direction, then i clipped right up to the point and now it will turn perfectly! then to add the flat piping i very carefully measured and pinned bias tape in place and hand basted then machine sewed it in place. i left it hanging an inch or so at the center (i used two separate strips of bias so i could overlap them neatly at the center) because i wanted to make sure the piping was positioned just right! now, before topstitching the piping and the neckline seam in place i needed to check the fit. to do this, i simply pinned the zip in place and tried it on. back to the neckline… i turned the neckline to the inside and pinned it in place. i made sure the piping was even all the way around and not peeking out higher in random places (measure if you’re as particular about these things as i am). 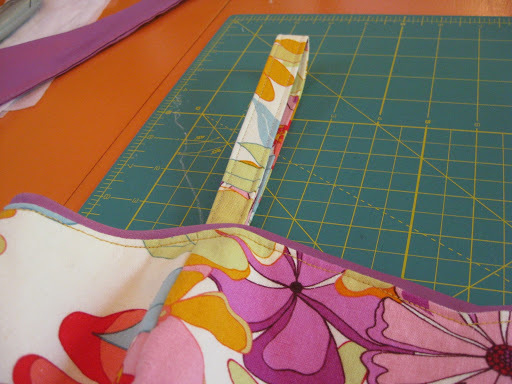 with everything positioned the way i wanted i was ready for topstitching! if you want your topstitching to stand out and be a detail on the garment, make sure to use actual topstitching thread because it is thicker than regular sewing thread. i am so very happy with how well the piping turned out. it really does pay to take your time and do something right! next up, attaching the skirt and adding a not really waist stay!